A cornucopia of beauty! Soft peach roses are contrasted by dark orange asiatic lilies, bronze button chrysanthemums and yellow sunflowers. They are accented by stems of huckleberry and yellow oak leaves and arranged exquisitely inside the impressive Autumn Beauty Vase. It's a breathtaking keepsake that adds elegance all year long! This is one tasty arrangement. 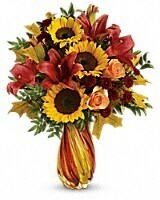 Elegant peach roses, dark orange asiatic lilies, bright yellow sunflowers and bronze button chrysanthemums are adorned by festive huckleberry and light yellow oak leaves. This arrangement comes inside the lovely Autumn Beauty Vase and adds sophistication to any Thanksgiving dinner table! 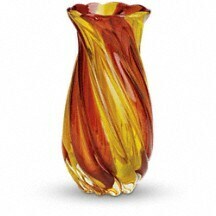 With its rich gold and amber tones spiraled to perfection, this elegant hand-blown glass puts an upscale twist on any décor. 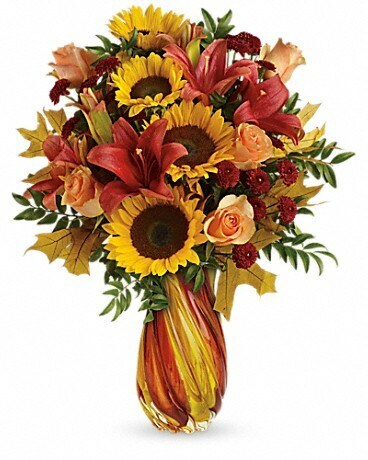 Exclusively from Teleflora's Flower-in-a-Gift Collection, it's a work of art in itself.